Almond Verbena (aloysia virgata). Non Culinary verbena grown for it's sweet smelling flowers. 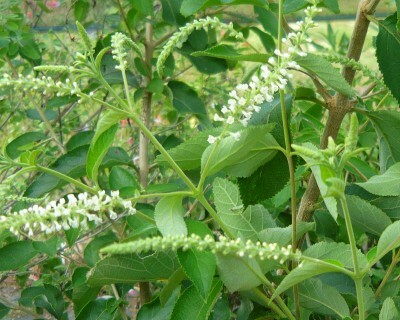 Also known as incense bush or sweet almond verbena. Slender silver/green leaved bush blooms continuously with small white flowers that have an intense and highly fragrant sweet vanilla-almond scent that can be noticed from quite a distance. Honeybees and butterflies adore it. Very drought tolerant once established. Can grow to a large bush in temperate climates. Prefers full sun and well drained soil. Perennial zones 8 - 11. Live plant in 3 inch container.